Maintaining the correct water temperature in your aquarium can be the difference between success and failure. That’s why it’s SO important to be able measure it’s temperature accurately. And while heaters are great for regulating your tank’s temperature, their readouts aren’t always 100% accurate. Having a separate thermometer can help you track and adjust your tank’s temperature accordingly. 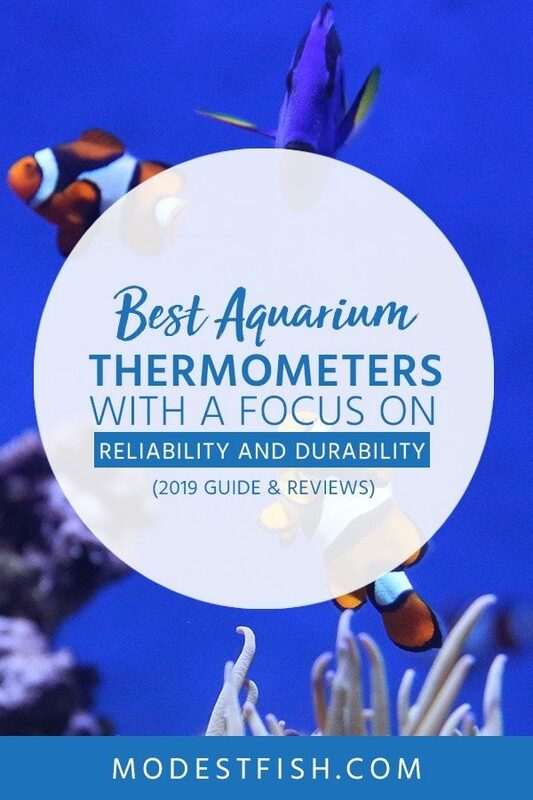 In this article, you’ll discover what you need to look for when choosing the best aquarium thermometer. 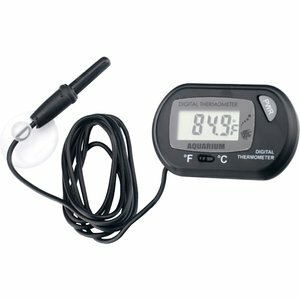 Then I’ll share my best picks for the most accurate and durable thermometers available today. Sensitive color changing liquid crystals to display the temperature. A thermometer has one job, so there’s no need to buy something that’s complicated to set up. All you want to do is to place it and your tank, and away you go. However, some electronic thermometers may need a few extra steps, but these don’t tend to be complex. It should be accurate to within at least +/- 1 degree Celsius. The more accurate, the better it is. The range of temperature shown on the thermometer is important. Yes, it’s obvious, but it’s something that could be overlooked. You should look for a range from 50 degrees F (10 degrees C) to 104 degrees F (40 degrees C). Even though thermometers tend to be inexpensive, you still want something that’s going to last and stay accurate. Look for long-lasting durable materials. And if you buy a classic mercury thermometer, you’ll want one that’s not likely to crack or break and is fully submergible. Leaking mercury into you tank will have devastating effects. Electronic thermometers should come with a probe attached to an LCD display. And it’s always a bonus if it includes extra batteries. If you’re like me, and your eyesight isn’t quite what it once used to be, you want one that’s easy to read so you can quickly check the temperature. I find that thermometers with a probe and LCD temperature display are the easiest to read. However, mercury or color changing crystal thermometers can work fine too. The best thermometers will often display the temperature in both Celsius and Fahrenheit. Although, this is not 100% necessary. Most fish and marine life need a very specific water temperature in order to stay alive and avoid diseases. So being able to monitor the temperature in your tank is essential to the success of your aquarium. Temperature readouts on heaters are not always 100% accurate, having a thermometer in addition to your heater will provide you with a more accurate readout. This will remove the need to guess – allowing you to heat or cool down the water in your aquarium to suit the needs of it’s inhabitants. If you’re looking for an excellent thermometer that’s reliable, durable, and most of accurate, you’ll find what you’re looking for in this list. This is very easy to read due to it’s large LCD display, which is attached to a submersible probe. It features a suction cup, so you can attached it to the outside of your tank and monitor with ease. If you’re looking for an accurate readout, this might be the one for you. Displaying temperature measurements within 0.1 degrees! And has a temperature range from -50 to +70 degrees celsius. A nice bonus is that it’s powered by one LR44 battery. These are long lasting and easy to replace. Making this a great choice if you’re looking for an accurate and durable thermometer. Another excellent digital thermometer, it uses an LCD display that’s easy to read at a glance. And features a submergible sensor probe for accurate temperature readings within +/- 1 degree Celsius. And measures the temperature in 0.1 increments. You can switch between Celsius and Fahrenheit, and has a massive temperature range from -50 to +70 degrees Celsius. Featuring two suctions cups for a stronger hold, you can fit this to the outside of your tank for easy reading. Easy to set up in minutes, this is an accurate and effective thermometer. Again, we’ve got a nice large LCD display with probe. You’ll find this very easy to read and monitor your tank’s temperature. It’s versatile, offering a temperature range between -50 and +70 degrees Celsius. And it displays precise, 0.1 degree readouts which are accurate to +/- 1 degree. You’re able to use a simple switch to change from Celsius to Fahrenheit. If you’re looking for a simple no fuss thermometer, this might be the one you’re looking for. No fancy LCD displays here. The American Thermal thermometer uses sensitive color changing liquid crystals. These light up to immediately display your tank’s temperature. They’re clear and easy to read. A straightforward peel and stick design can’t get any easier to install. Just remove the release paper and place the thermometer below the waterline on the outside of your tank. What’s nice, is that you can remove and reposition it – without it losing stickiness. I would say this style of thermometer works best when complimenting a more accurate thermometer with a LCD display. Again, if you’re looking for a simple and basic thermometer this could be a great choice for you. Using the easy stick peel and stick design, you mount this vertically on the outside of your tank below the waterline. Featuring color changing liquid crystals, the numerical display is very easy to read and is fairly accurate. You can remove and reposition the thermometer. It’s best suited to smaller tanks. Again, I would recommend using this with another more accurate heater. Taking into account ease of use, accuracy, durability, and readability. You can’t go wrong with any of the RISEPRO, HDE, or Zacro thermometers. They all provide you with precise readouts which are accurate and easy to read at a glance. Check out the prices and go with the one that fits your budget. 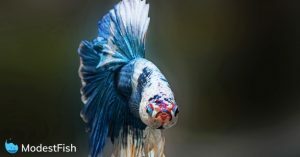 If, for any reason, your aquarium temperature strays far outside the recommended range for your fish. DO NOT try and adjust it quickly. 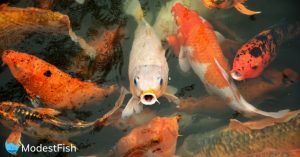 Sudden changes in temperature can be harmful to your fish and can sometimes lead to death. 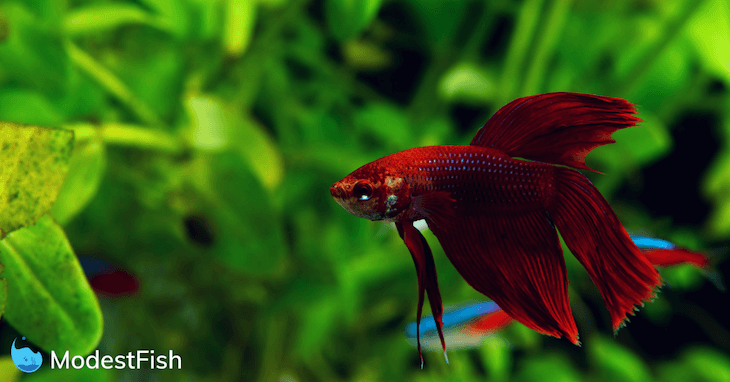 You should gradually add warm or cold water (depending on the change) to your tank so your fish can acclimatize.